Prep your breakfast so all you have to do is heat and dive in with these Instant Pot or Ninja Foodi On the Go Omelette Mason Jars. Filled with tons of protein and flavor. Eggs, ham, bacon, cheese, and more come together for one savory omelet! 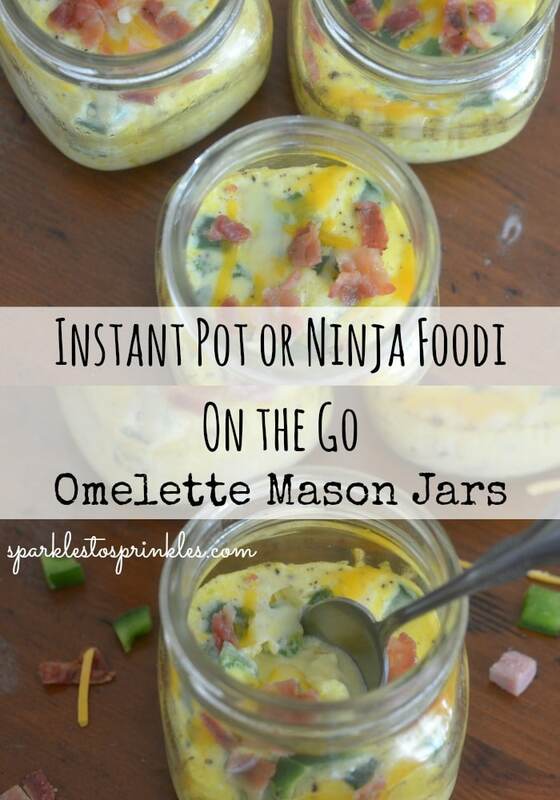 These Instant Pot or Ninja Foodi On The Go Omelette Mason Jars are going to be your new life saver. With 4 boys I am all too familiar with hectic mornings. With just a tiny bit of meal prep, I am able to get a week worth of breakfast made in less than an hour. Many years ago when my second youngest was having trouble with a bit of hyperactivity during school. One of the most important adjustments that I made was giving him a high protein breakfast before school. Eliminating bread and sugars made such a big difference in his ability to be calmer and pay better attention in school. Where was my instant pot than???!!! This would have made my mornings so much easier and kept us from having a morning where we had cereal on the run out the door because we ran out of time. You can load your omelets with whatever your favorites are. I like to change mine up so this way there is a nice variety during the week and no one gets bored. My first batch I used the lids (lids only, not the rings) to lay on top of my jars during cooking so that water does not splash inside. Occasionally the lid will create such a tight seal during cooking that it took the eggs much longer to cook. I would recommend laying a piece of aluminum foil over the top, I found that worked the best. 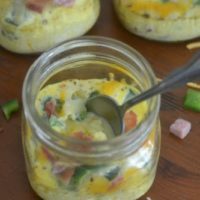 These mason jar omelets will leave you coming back for me. With the Instant Pot or Ninja Foodi it makes the cooking even easier. You get that light and fluffy egg that is blended with meats and more. 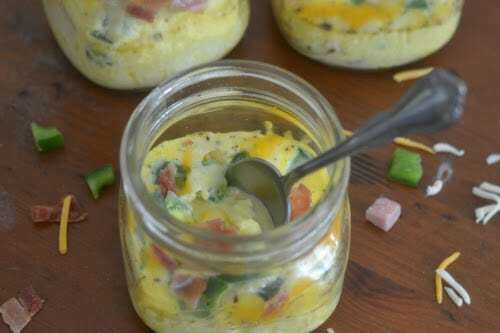 Plus these on the go omelets mason jars are so versatile to dress up with your exact flavor combinations. Here are some other ingredients you might want to toss in with your omelettes as they bake away in your Ninja Foodi. As you can see you can use almost any combinations to really make an omelet to fit your needs. I also will make variations to fit what my husband likes, kids and then myself. That way everyone gets exactly what they want. Yes! You can freeze mini omelettes and then reheat them later. If you freeze in the mason jars, just remove the lid and all metal before you pop in the microwave to reheat. You can even thaw in the fridge the night before and then reheat in the oven or microwave in minutes. 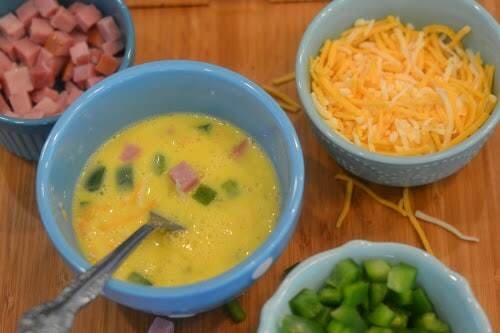 Give these easy mason jar omelets a try, and see how you like it. The beauty of this recipe is the versatility in ingredients, and you can use your Instant Pot or Ninja Foodi! I am loving my Foodi and use it any chance I get. If you are on the fence on purchasing one, I say dive right in and try it. If you are a fan of the Instant Pot or Air Fryer, you are bound to love your Ninja Foodi. Search my site for all the incredible recipes I am making. For a great weekend breakfast or brunch meal, try my Ninja Foodie Cracked out Tater Tot Breakfast Casserole. It is a perfect hearty casserole that is well deserved after your long week. Spray your Mason Jars (at least 8 oz, I used pint wide mouth jars) with canola spray. In a separate dish, scramble 2 eggs with 1 TBSP of milk or heavy cream. Pour into mason jars. Repeat process until all 5 jars are filled. Place jars in your pot on a trivet. Pour in 1 cup of water into your pot. (I was only able to fit 3 the first time. I did another batch with 2 jars.) Place a piece of aluminum foil over the top of each jar. Lock the lid in place. Select High Pressure and set the timer for 8 minutes. Carefully remove the mason jars from the Instant Pot. Sprinkle with more shredded cheese & bacon. Let cool completely. Cover with lids and refrigerate. This recipe will make 5 jars. Depending on the size of your pot, you may not fit all 5 in at once and have to cook in two batches. I thin you used half pint jars, correct? i actually used pint wide mouthed. you can really use any jar you have. The wide mouth makes it a tiny bit easier for the kids. i am so sorry, I updated the recipe. I found using aluminum foil worked better. If you use the lids, they may make such a tight seal that the eggs do not cook as well.